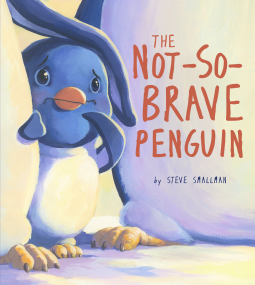 Brave little buddies-The Not-So-Brave Penguin by Smallman – Joyce's mystery and fiction book reviews with some non-fiction too! This is the story of two penguin friends, Percy and Posy. Percy sees life as an adventure and is fearless while Posy worries about many things. One day Posy is worried because Percy has not returned. Those around her attribute this to Posy’s usual way of being but Posy is certain that Percy needs help…so…she does many brave things in order to find and save him. This story is a reminder that we can do brave things even when we do not feel brave inside. It lets young listeners know that it is okay to have fears and also that one does not have to be ruled by them. One small quibble…it seems stereotypical that the boy is brave and the girl afraid at the start of the story. The illustrations in the book are appealing. This book seems like a good resource for pre-schoolers. There are additional resources for adults at the end of the book. Thanks to NetGalley and Quarto. The opinions expressed are my own. I love all the therapeutic children’s books you review, Joyce. So many helpful ones here like this one!